Sungei Buloh Stint: a little odd or an odd Little? 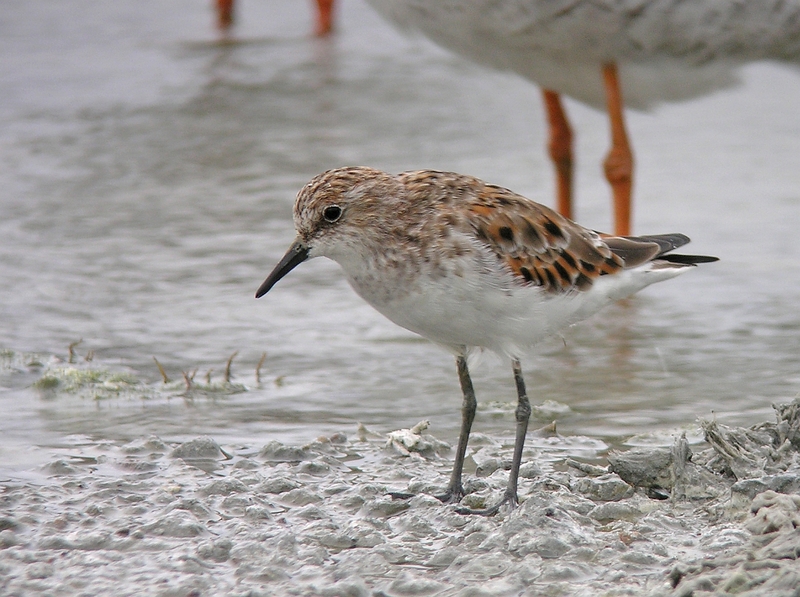 An increasingly expert and dedicated band of waderphiles in Singapore have been eagerly awaiting a the arrival of a long-overdue addition to the Singapore list – Little Stint. 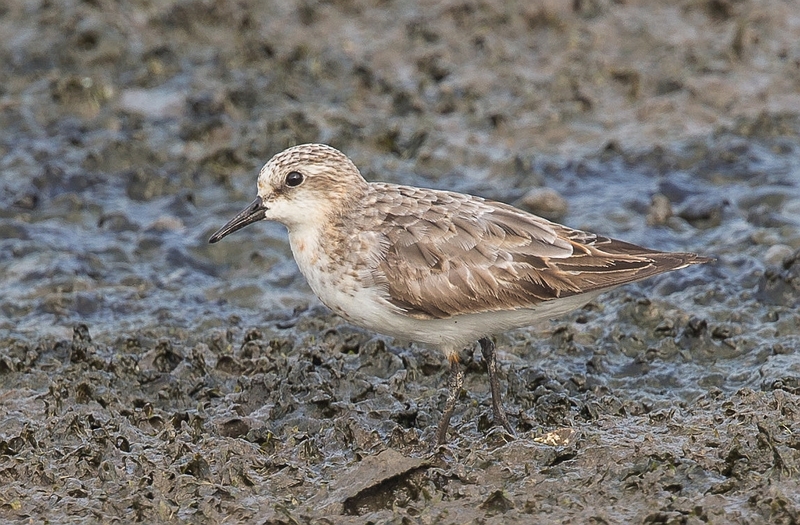 Little Stints have been found to be a scarce but regular migrant and overwinterer in Peninsular Malaysia in recent years, but partly perhaps because stints as a whole are relatively scarce in Singapore, so far, any Littles have escaped detection. Francis Yap posted this picture on FB yesterday, and it was interesting enough for me to ask for more pics. Francis was photographing waders in Hide 2D when, he recounts, “This little peep just landed in front of the hide…I assumed it was a Red-necked Stint but the rest of them were in another position far away. It did not stay long though.” He sent me a range of excellent pics, which he’s given me permission to post here. Why did it interest me? What made got my wader-senses tingling was the isolated rather dark-centred, gingery-edged median and greater coverts and tertial (one on each side). The bird is an adult in moult between breeding and non-breeding plumage. 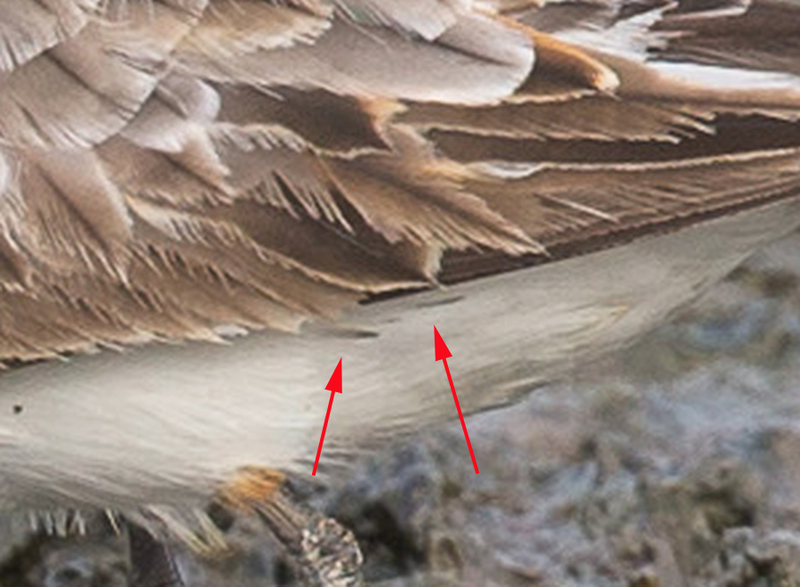 The “interesting” feathers are all very worn breeding plumaged feathers. The moult on both sides of this bird is quite synchronous (symmetrical). That’s not always the case, so it pays to try to photograph both sides of a challenging or interesting bird. What’s interesting about these feathers is the large dark centres with fairly sharply contrasting pale edges, some of which have a gingery or orange tone. 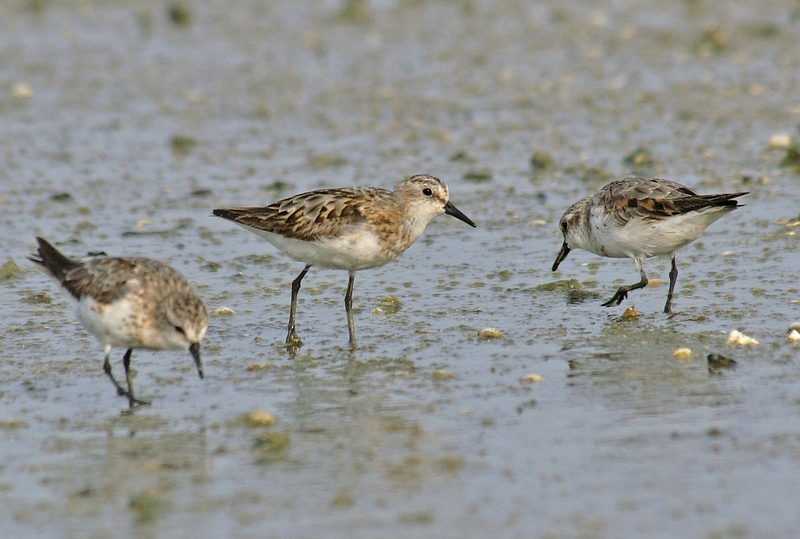 In spring, fresh breeding plumage coverts and tertials on Red-necked Stint tend to be rather dull and uncontrasty, with darkish brown centres, shading paler toward the edges and thin, weakly coloured edges which don’t offer a strong contrast with the centres.This and this are two examples which illustrate the point. Adult Little Stint, Kapar, Selangor, 9 April 2009. 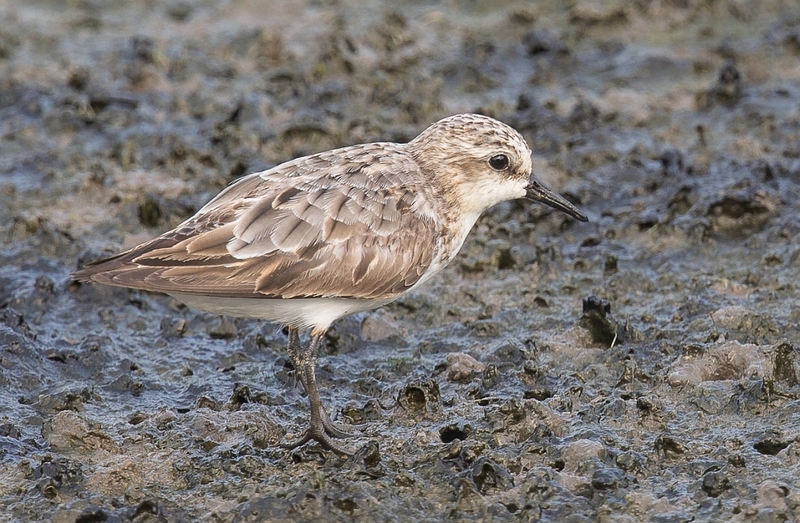 In spring, breeding plumaged Little Stints, on the other hand, have solid black centred coverts and tertials (the latter not yet moulted on this bird) with broad orangey edges which contrast strongly with the centres. These really stand out, even at a distance (see this one for instance). Adult breeding Red-necked Stint, Penang, 5 Aug 2008. The contrast between the centres and the edges is even weaker than in spring, making the wing look very bland. Adult breeding Little Stint, Penang, 5 Sept 2009. Faded, but still showing evenly dark centres, contrasting rather strongly with orangey edges. So, when I saw those dark centres on the Singapore stint, I wanted to take a second look! As always with bird id, and especially wader id, it’s a question of building a case based on multiple factors, never just one. 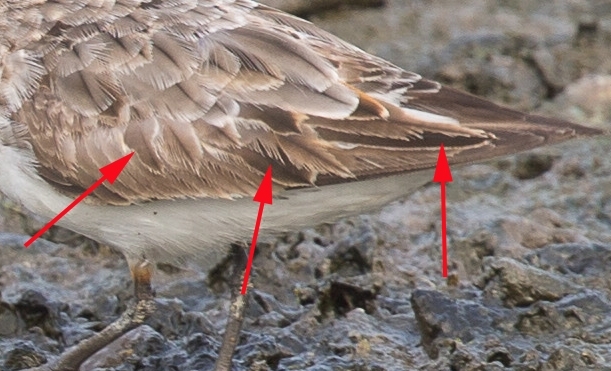 So, if this is a Little Stint, what other things should we be checking? Francis’s photos present a bit of a challenge in that, taken from a high vantage point (a hide), they are looking slightly down on the bird, which foreshortens vertical distances, like leg length and body shape. 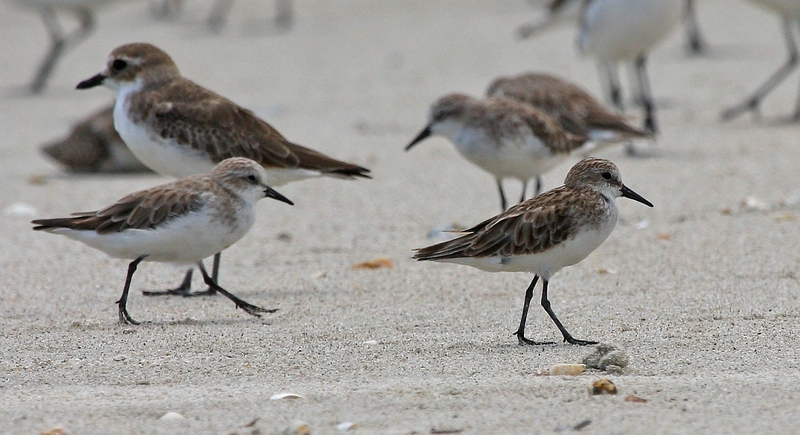 Note how large-headed and ‘neckless’ the Red-necked Stints seem to be, and their noticeably shorter legs. 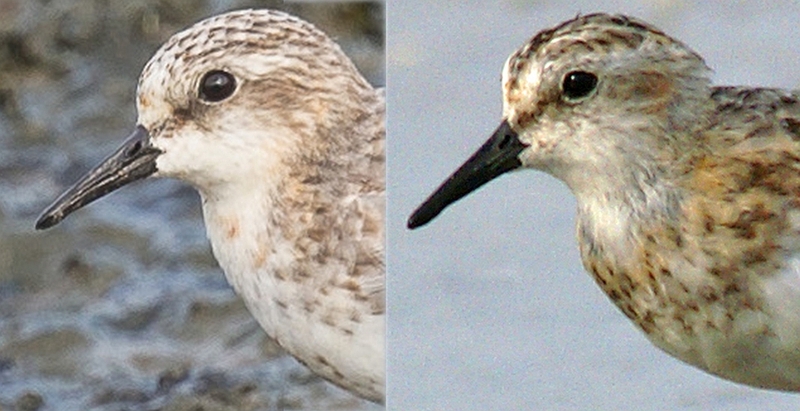 An impression of the more upright posture of Little Stint, looking more round-bodied, with the head ‘on top’, compared to the more horizontal posture of Red-necked, with large head ‘stuck on the front’ (and no neck!). Even though blurred, you can get a sense of the difference in bill shape from this picture, and the longer legs of the Little. All the features noted above are in evidence here. Each one is rather subtle, but combined they add up to a rather distinctively different overall appearance. So how does the Sungei Buloh stint do on the structure test? The bill shape, length and thickness is typical of Red-necked but within the range of Little. The legs, even allowing for the foreshortening angle, don’t look long. The body shape and posture are right for Red-necked but not for Little. Ditto the rather large squarish head and thick neck. 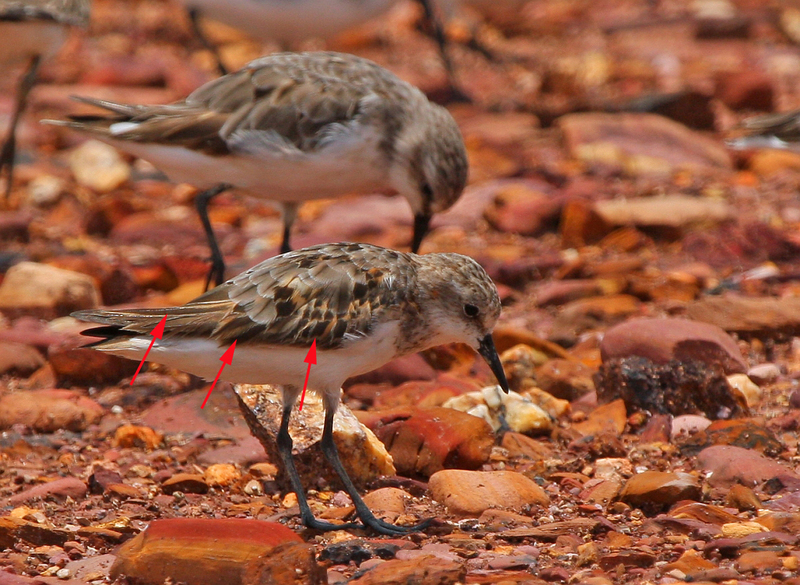 The presence of clear brick-coloured feathers on the throat or upper breast should be diagnostic of Red-necked. The presence of clear black feather streaks on the rear flanks is a party-pooper, as Little never shows anything as clearcut as this. At most, there are some brownish feather shafts. 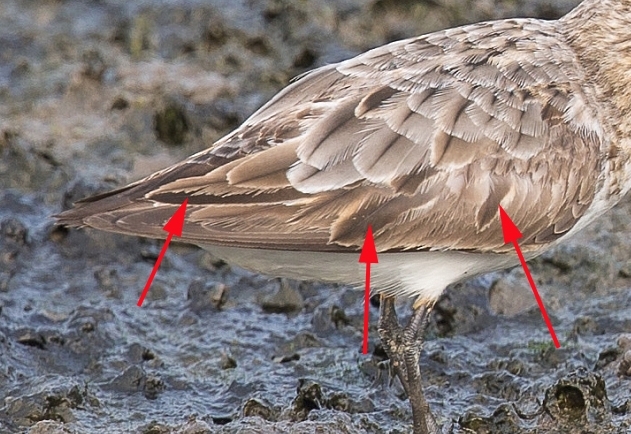 Though difficult to see, the rump and back feathers can provide a clue if they are still breeding plumage. Being among the most protected of all feathers on the body, they are often less worn than more exposed feathers, and seem to be moulted later as a consequence. The presence of chestnut edges to rump and back feathers is diagnostic of Little. The Sungei Buloh bird lacks them on the unreplaced breeding feathers. A different bird from the one above, with even more marked orangey edges to the rump feathers. In adult non-breeding plumage, Little tends to show overall darker grey upperparts, with individual feathers showing a larger darker centre than is typical for Red-necked. However, I’ve found this to be at best a suggestive factor. 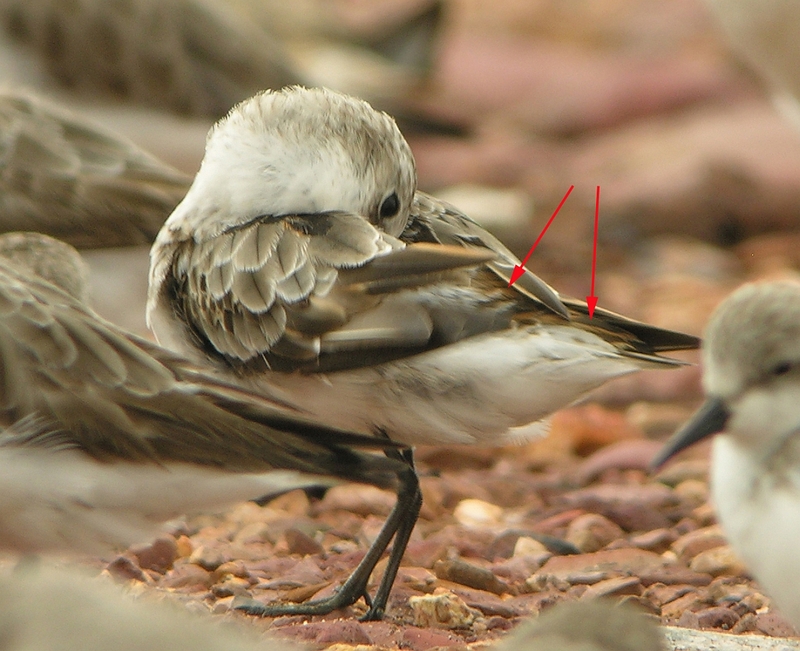 There are plenty of Red-necked with dark-centred dark grey upperparts feathers, and some Little (like the one above) can show clear grey scapulars with little darkening in the centre. 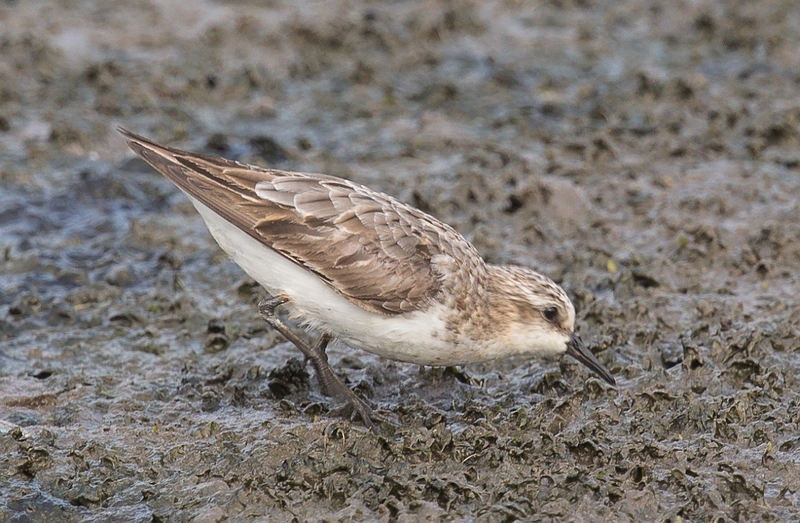 Francis was right, his bird was ‘just’ a Red-necked Stint. 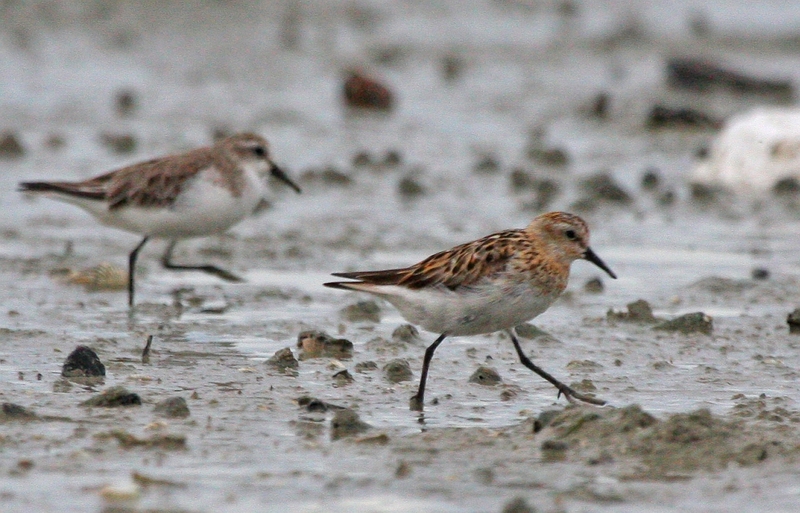 Hopefully the process of making sure will aid the search for Singapore’s first acceptable Little Stint, and there is no better time of year to find one! 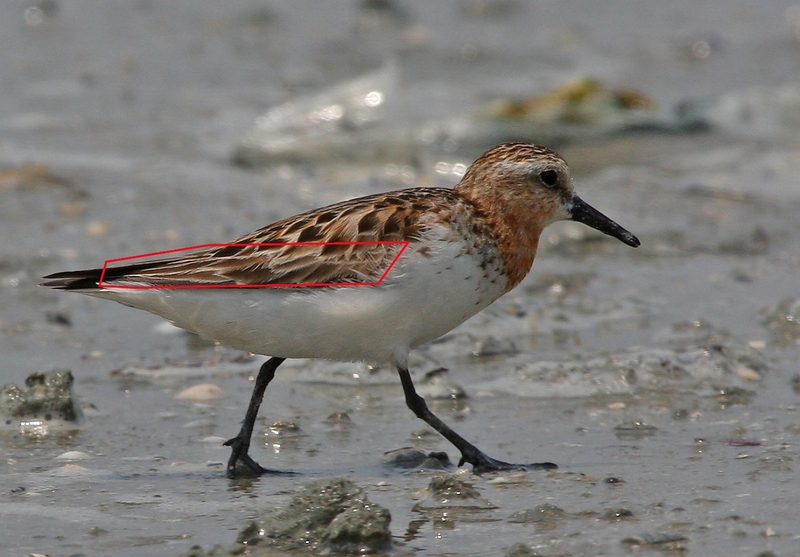 Dave, thanks very much in piecing together the different markings between the RN and Little Stint s to allow us to compare. 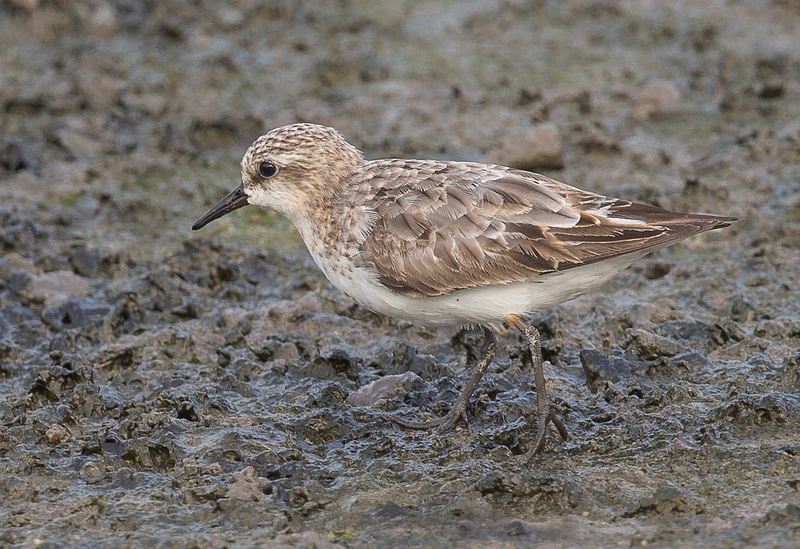 At the very least, we will now pay more attention to these stints and know how important it is to get decent photos from differnet angles of these waders. First rate analysis Dave, thank you very much for the time and effort you invested in this piece! What a wonderful analysis of the difference between the two species. Thanks for sharing and your expert comments. We are still looking hard for the little stint here! Thanks Alan, Ayuwat, Killian and Kenneth – I’m glad the post is useful. I have to say that I consider an endorsement from ‘KM’ to be the ultimate accolade!